Mileage may vary depending on your reading and voice acting skills, but I thought I’d list some books our boys have enjoyed in case there are any parents out there looking. Warning! This entry for parents only … and beware of shameless ads. Babies love to see other babies’ faces for some reason and Margaret Miller’s books are just that: Big pictures of babies with simple keywords attached to each (“Boohoo!”, “Yippee!”, “Yum-Yum”). The Clang! Clang! Bang! Bang! book has a little rattle attached to it that makes noise when the whole book is shaken. 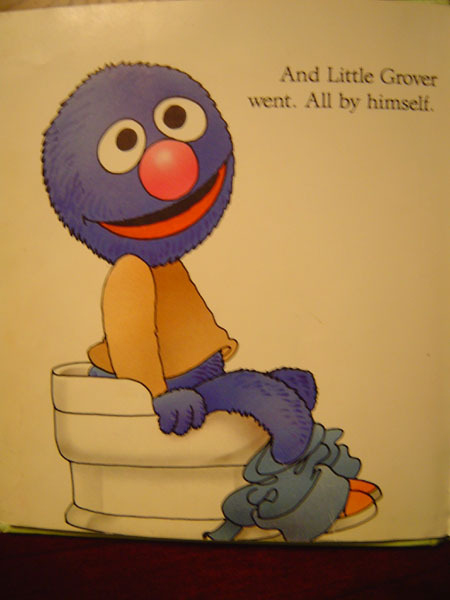 I will only ask this one question: Are Little Grover’s eyes crossed there? Others in the series that are not on Amazon: Say The Magic Word, Please, Little Ernie’s Book of ABCs, Say Bye-Bye.